Once you put one of these super sensory bean bags in your hands, you’ll quickly discover why they are nicknamed COOLBEAN. Each bean bag is covered with soft chenille fabric nubs, making them irresistible to the touch. Grasp them, squeeze them, and listen to the crinkling sound they make. They come in 4 bright colors and are the perfect size and weight for tossing and catching. COOLBEAN definitely engages the senses—vision, hearing, touch and kinesthesia (sense of body’s movements). What also makes Excellerations® Super Sensory Beanbags “really cool” is that they are for children ages 18 months and up and are even washable! Younger children may find bean bags easier to handle than a ball. A bean bag is usually smaller and softer than a ball; consequently a child has less fear of being hit or hurt. Because bean bags can’t roll away, they may be less frustrating for the child with poor coordination skills. Catching and throwing a bean bag helps a child develop the skill of grasp and release. A bean bag will help a child develop the hand strength required for handling a ball. Here are some fun and challenging bean bag activities for young children. In next month’s post, I’ll share several games that you can play using bean bags. Child tosses bean bag upward into the air and catches it before it hits the floor. Child first catches it with two hands. Child then attempts to catch the bean bag with one hand and then the other hand. The height of the toss should increase as the child’s skill improves. Child tosses the bean bag back and forth across the body from one hand to the other. The height of the toss and the distance between hands should increase as the child’s skill improves. Child tosses the bean bag into the air, turns around and then catches it. Challenge child to clap hands once, and catch it. Ask child to clap hands twice, then catch it. Place a hoop on the floor, lean it against a wall or hang it up. Have child step back and throw a bean bag into the hoop. With each successful throw encourage the child to take another step back to make it more challenging. Attach a target to a wall. I like to use one of the Excellerations® Pair-a-Chute. Keeping his “eye on the target,” the child throws bean bags at the different colors on the parachute. Find a partner and play catch with the bean bag. Remind the child to use only his hands to catch and to keep his eyes on the bean bag. Play catch with your partner throwing underhand. Play catch with your partner throwing overhand. This time, stand close to your partner and play catch. If you catch the bean bag without dropping it, take a step back. If you drop it, take a step up. See how far apart you can get playing catch with your partner. Using both hands, one child holds a bucket or basket. Let the other child toss bean bags to the child holding the bucket, who attempts to catch each one in the bucket. Have child place bean bag on a body part—head, arm, shoulder, elbow and walk in the open space or on a designated line marked out on the floor. Try a crab walk with the bean bag on the tummy or a creep like a cat with a bean bag on the back. Have child place bean bag on the floor. Ask the child to jump forward over the bean bag. Ask them to jump backward, then sideways. You can repeat this series several times. Have child place bean bag between their knees and jump forward like a kangaroo. Sometimes it just takes a book to start the action. I’ve compiled a list of favorite children’s picture books that will encourage kids to get up off their seat, onto their feet…and get moving! In this extraordinary board book, children learn action words and get the wiggles out by imitating animals. From Arch to Balance, 26 action words, each headed by a different letter of the alphabet, are introduced, each accompanied by a pleasant verse that links the word to an animal. Dramatic photos of wildlife in action and delightful spot photos of young children imitating the animals’ movements punctuate the action. This book is a child and teacher friendly program which is both a fun and easy method teaching kids yoga postures from A – Z with a sing along & narrated CD and DVD demonstration. A song accompanies each letter and pose with whimsical illustrations and photographs that stretch the body and imagination. “Stomp your feet! Clap your hands! Everybody ready for a BARNYARD DANCE!” An assortment of irrepressible farm animals join in a rollicking square dance. As an education tool, children will learn to recognize farm animals, and associate simple verbs to the action, such as bow, bounce, swing, and leap. And most importantly get up and dance! Learn how your bones and muscles, heart and lungs, nerves and brain all work together to keep you on the go. Kids walk and skate and tumble through these pages with such exuberance that even sprouting couch potatoes will want to get up and bounce around—and that’s the ultimate goal. Studies show that American kids are becoming more sedentary and more overweight and that they carry these tendencies with them into adolescence and adulthood. 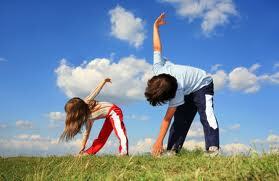 Experts agree that we need to help kids make physical activity a life-long habit. Through education, information, and encouragement, this book aims to inspire a new generation of busy bodies! This exuberant, interactive picture book starring a bossy little ladybug and a GIANT hungry frog will have kids leaping up and down and out of their seats, doing the chicken dance, and make silly scary faces of their own. to join this menagerie of zany animals and children as they stomp, wiggle, roar, and spin their way through the day, as the rhyming text reinforces important concepts. From their heads down to their toes, kids will be wriggling, jiggling, and giggling as they try to keep up with these animals! Alligators wiggle, elephants stomp, gorillas thump, and giraffes bend. “Can you do it? I can do it!” is the confidence-building message of this fun-filled interactive picture book. A playful introduction to motion in the animal kingdom that invites young readers to guess some of the unusual ways that animals get around. Follow them as they swing, dance, float, leap, and slide from page to page, then learn why these animals move the way they do.This book is wonderful for learning about how your body can move and how each animal can move. When a group of young children set off with their teacher on an orderly walk through the park, the very last little girl spies a “squiggle” (a piece of string) on the ground and picks it up. As she twirls, twists, and turns the long red ribbon, she imagines it to be a dragon, a thundercloud, a “full fat moon,” and much more. She hastily rejoins the group and, much to their delight, demonstrates her treasure’s potential. Then the youngsters continue the walk, not as a “bunched-up, slow, tight, straight line,” but in exuberant squiggle-style, instead. Give each child a streamer ribbon or streamer scarf and let them create their own “squiggles” as your read the book again and again. We all come in different shapes and sizes, and it doesn’t matter if you are tall, short, skinny, or round. Your body is your own, and you need to take care of it. This book is the perfect catalyst to get readers moving. Vibrant, fun-filled illustrations and an encouraging text explain the many great reasons to exercise, from making new friends to going new places, or just because it’s good for your body. Here is a playful introduction to nine simple yoga exercises for toddlers. A fun book even for those that know nothing about yoga as it relates the poses to well known animals. For example, “standing forward bend” is renamed “monkey” because the pose resembles a monkey bending over. The back of the book has photos of actual children doing the poses as well as tips and an explanation for teaching the poses correctly. Sung as an echo song (to the classic tune of “How Dry I Am”), and accompanied by hand and body movements, children will laugh out loud at the antics of the Aunt, who in each verse travels to another strange place and brings back some unusual things. The much-loved children’s song, Tony Chestnut , comes to life in an interactive children’s picture book with accompanying CD. “The Book About Tony Chestnut” invites children to actively join-in, participate and connect with the storybook’s characters (Eileen, Neil, Pat, Bob, Russell and Skip). Tony Chestnut uses the sounds of his name (Toe, Knee, Chest, Nut) to sing this really cool song. As he starts singing he points to the corresponding body parts. “Toe Knee Chest Nut Nose Eye Love You Toe Knee Nose.” The song starts out slowly, in order to get the kids used to pointing to the body parts, and then quickly picks up speed. It’s fun trying to keep up! If you’ve ever heard the song “We’re Going On a Bear Hunt” then you know the way the story goes. It encourages movement and active involvement. Stand up and act out the story and use hand and body motions as you read…to cross the tall wavy grass (swishy swashy), ford the deep cold river (splash splosh), tromp through the ooey-gooey mud (squelch squelch), wander through the deep dark forest (stumble trip! ), run through a whirling snowstorm (Hoooo woooo), and at last enter a deep dark cave (tiptoe). “What’s that? It’s a bear!” And now it’s time to run back over every place you’d been before to escape. In this beautifully illustrated rendition of a well-known children’s chant, two sisters are looking not for a bear but for a lion–a lion that lives on the African savanna, where the girls go through swishy-swashy long grass, a splishy-splashy lake, and a Big Dark Cave. When they finally meet their lion, they have to run, run, run through it all again to get back home. Like Michael Rosen’s “We’re Going on a Bear Hunt” this picture book will encourage preschoolers to participate and move. With simple instructions, this wonderfully illustrated book introduces kids to yoga in a fun and interactive way. Each pose is introduced like an animal and kids can then do the movement as well as make the animal sounds— flutter like a butterfly, hiss like a snake, roar like a lion and more. A Whale of a Role Model! I feel very fortunate to live near the ocean in Santa Cruz, CA. It continually inspires me to venture outside and enjoy all that it affords. It is a place of beauty, incredible wonders, and home to the greatest diversity of life on earth. 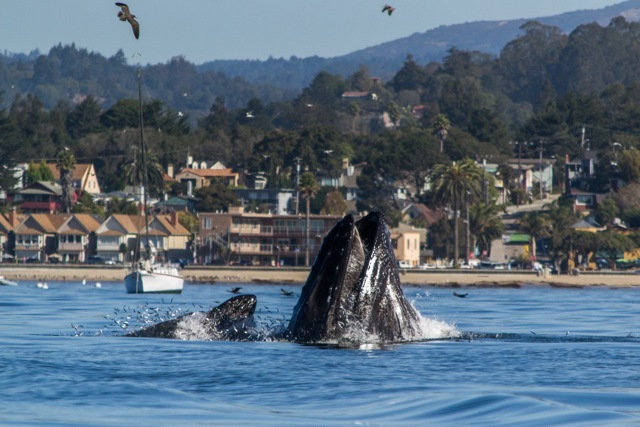 This week, humpback whales can be spotted not far from the beach. They are joining herds of sea lions and flocks of birds to dine on the abundant anchovies that are present in the bay. In the photo below taken by Chris Elmenhurst, you can see a mother humpback teaching her baby calf how to feed on the tiny green fish. The whale mother and her baby will share the strongest of bonds for one year with the mother preparing and strengthening her newborn for the long migration up the coast. It’s common to see a baby trying to perform a good breach over and over and then have mom come up unexpectedly to show junior how it should be done. Photo by Chris Elmhurst at Surf the Spot – click photo to view more photos. While I was watching the humpbacks, I also spotted a mother and son exercising together on the beach. I couldn’t help but notice the correlation between the mother whale with her calf and the mother and son lifting weights. Just as the mother whale role models for her baby, so does a physically active parent role model for her child. Parents who encourage and endorse physical activities in their own lives are more likely to pass on these good habits to their children. Research shows that children who exercise do better in school, control themselves better, and have fewer behavior issues. More good news is that children who lead active lifestyles are likely to remain active as adults and pass on their healthy lifestyle habits to their own children. Whether you’re a parent or a teacher, be a role model. 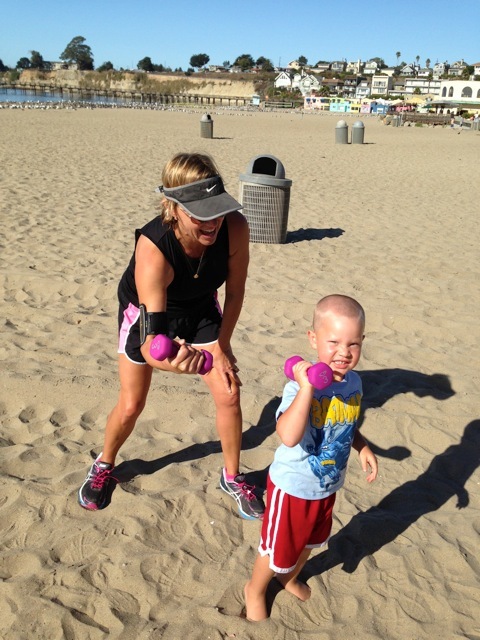 Show children physical activity is important by enthusiastically participating in it!